Parents who complained that The Lion King was traumatic and scary obviously forgot about this Disney classic, based on the somewhat grittier Carlos Collodi story. 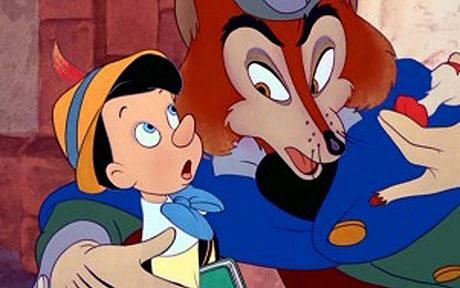 It was Disney’s most explicit moralizing, and with its constant sexual imagery it’s like A Clockwork Orange for kids. Pinocchio, the puppet who wants to be a real boy, falls victim to a Dickensian cast of shady characters, including Honest John the fox, Stromboli, the Coachman of Pleasure Island, and Lampwick, who turns into a donkey in what is surely the most chilling sequence Disney ever produced (and that includes ‘Night on Bald Mountain’ in Fantasia). Meanwhile, Jiminy Cricket (voiced by Cliff Edwards) acts as Pinocchio’s conscience, thwarted at every turn by the temptations that lead Pinocchio astray. In a truly awe-inspiring set piece, Pinocchio redeems himself by rescuing his father-creator Geppetto from the jaws of Monstro. And you won’t soon forget the nightmarishly decadent Pleasure Island; for a few disorienting minutes, we seem to have detoured into a Ralph Bakshi cartoon. It’s difficult to say what Pinocchio will mean to today’s jaded kids, but adults may well find much of it disturbing. This is probably the pinnacle of the genuinely great Disney quintet (Snow White, Fantasia, Dumbo, and Bambi are the others).